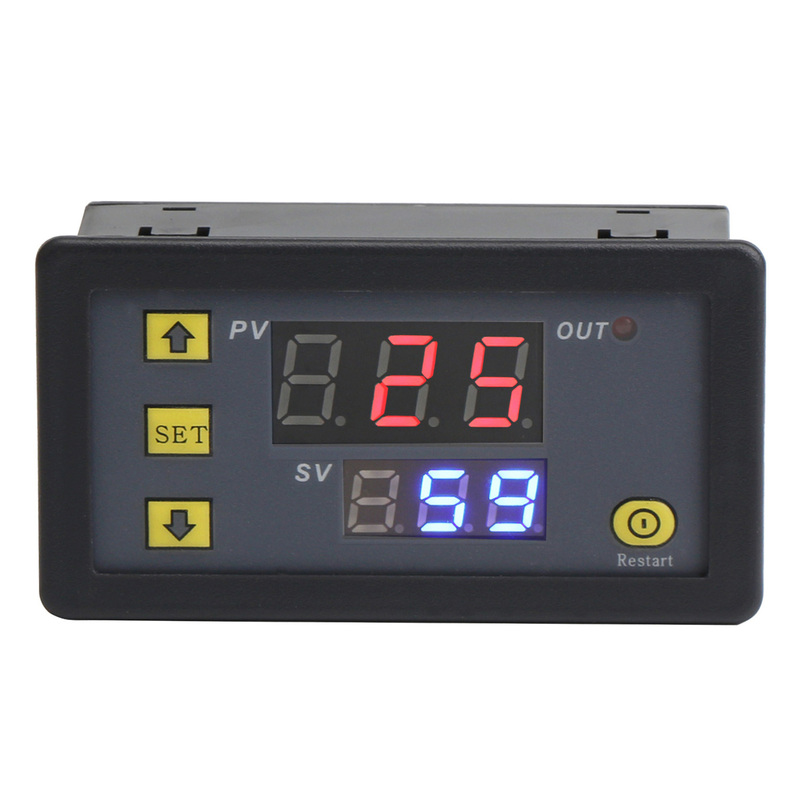 It is a Real Time Relay Time Control Switch/Multifunction Relay Controller, Wide voltage range: 5.. 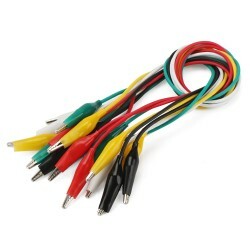 Feature: Color: Red/Green/Black/Yellow/White (2 of each) Length:19.6" (50cm) The alli.. 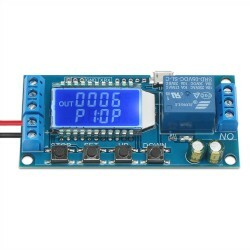 It is a DC 12V 1 Channel Multifunction Relay Module Loop Delay / Timer Switch / Self-Locking PLC .. 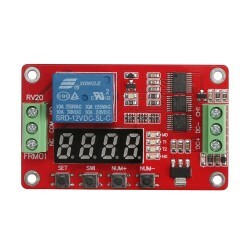 It is a Relay Module/Multifunction Controller/Digital Display Time Relay Module, Power supply: DC 24V, Maximum operating current: 10A, Maximum power: 1500W, Timing range:0 ~ 999S/0 ~ 999M/0 ~ 999H, Product features: timer / delay / cycle / covering 18 kinds of functions. Can be used for timing, delay, cycle timing, intermittent timing and other occasions. WARM TIPS: Please wait 6 seconds after finishing setting the data. The data set will be stored automatically after 6 seconds. Short press SET button once, then enter into time setting mode. When the red digital tube flashes, press ↑button or ↓button to adjust the time of the timing T1. When you finish the setting of T1, short press SET button again. When the green digital tube flashes, press ↑button or ↓button to adjust the time of the timing T2. When you finish the setting of T2, short press SET button again. Then the system will store the setting automatically in 6 seconds, please wait 6 second after finishing setting. Long press SET button, then enter into parameters setting mode. There are two groups of parameters for the users to choose, P0, P1. In the current mode, short pressing SET button can switch the parameter groups between P0 and P1. In each mode, you can press ↑button or ↓button to adjust the working mode you need. P0-0: The timing mode of T1 is second. P0-1: The timing mode of T1 is minute. P1-2: After T1 time delay, the relay pulls in (T1 timing). Then after T2 time delay, the relay releases (T2 timing). P1-3: After T1 time delay, the relay releases (T1 timing). Then after T2 time delay, the relay pulls in (T2 timing). P1-4: After T1 time delay, the relay pulls in (T1 timing). Then after T2 time delay, the relay releases (T2 timing) and repeat the cycle. P1-5: After T1 time delay, the relay releases (T1 timing). Then after T2 time delay, the relay pulls in (T2 timing) and repeat the cycle. e.g. : someone need to turn on after 10 seconds, then turn off after 20 seconds and repeat the cycle. Function 1: This product can be used in timing, delaying, cycle timing, intermittent timing, etc. Function 2: This product can be used in raft fishing machine, slow-down machine DIY. Function 3: This product can be used in timing switch machine, timing alarm control board.